BMC Rheumatology: a new addition to the BMC series! We are excited to announce the launch of BMC Rheumatology as the newest journal in the BMC series and to inform the scientific community that the journal is now open for submissions. Journal Editor James Mockridge tells us more about this exciting development. 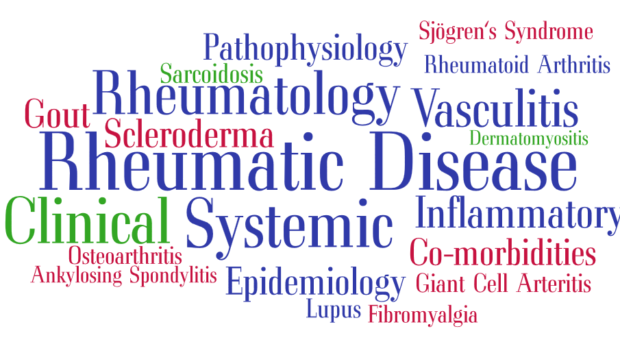 Rheumatology is a branch of medicine that is mainly concerned with disorders of joints, soft tissues, autoimmune diseases, vasculitis, and heritable connective tissue disorders – collectively known as rheumatic diseases. As these disorders generally involve inflammation/the immune system, rheumatology is generally seen as increasingly moving in the direction of autoimmunity. The most common, and therefore well studied, rheumatic diseases are osteoarthritis and rheumatoid arthritis, which cause pain and inflammation of joints and affect approximately 8.5 million people in the UK alone. However, these two conditions are just a couple of examples of rheumatic diseases as this umbrella term incorporates over 200 disorders. As illustrated in the figure above, these include conditions such as giant cell arteritis, fibromyalgia, Sjögren’s syndrome, sarcoidosis, gout and lupus, to name just a few. Given the nature of these conditions, they are often referred to as systematic and inflammatory rheumatic diseases. In addition to the burden of the rheumatic diseases themselves, it is now becoming clear that there are an increasing number of co-morbidities associated with rheumatic diseases, including cardiovascular disease, malignancies and infections. It is upon this background that BMC Rheumatology is being launched to provide the rheumatology community with an open access avenue to disseminate research findings into these diseases with the ultimate aim of improving patient care. As a member of the BMC series, the ethos of BMC Rheumatology will be open and inclusive, and the Journal will not make editorial decisions on the basis of the interest of a study or its likely impact. Like other journals in the BMC series, submissions will be rigorously peer reviewed to assess scientific validity. Furthermore, as an open access peer-reviewed journal, published articles will be freely available to all readers whatever their location. The remit of BMC Rheumatology will be to consider research on all aspects of the prevention, treatment and management of rheumatic diseases, including osteoarthritis and rheumatoid arthritis, but the Journal will place a special emphasis on systemic and inflammatory conditions and connective tissue diseases, along with related co-morbidities. BMC Rheumatology will complement and expand the open access journal portfolio within the area of rheumatology at BioMed Central and will be a sister journal to BMC Musculoskeletal Disorders within the BMC series. Although there is some overlap in scope, BMC Rheumatology and BMC Musculoskeletal Disorders will sit very comfortably alongside each other: BMC Musculoskeletal Disorders will have a focus on studies with a definite musculoskeletal component (i.e. bone, cartilage, tendon etc. ), whereas BMC Rheumatology will cover all areas of rheumatology, including systemic conditions and related co-morbidities, which are topics that will fall outside the scope of BMC Musculoskeletal Disorders. The Section Editors will be pleased to consider papers on all aspects of rheumatology across a variety of article types, including Research articles and Case reports, as well Study protocols for proposed or ongoing prospective clinical research. Why not submit your next paper to the journal? BMC Rheumatology will have its launch issue in November 2017, so submit now and be part of the journal’s launch. If you would like to know more about the journal, please do contact me, the journal’s Editor, by email (james.mockridge@biomedcentral.com). I will also be attending Rheumatology 2017 (25-27 April, Birmingham, UK) and EULAR 2017 (14-17 June, Madrid, Spain), and will be pleased to meet to discuss the journal further and answer any questions. James is the Editor of a portfolio of six of the medical journals within the BMC Series, including BMC Musculoskeletal Disorders, BMC Rheumatology, BMC Cardiovascular Disorders, BMC Endocrine Disorders, BMC Obesity, and BMC Sports Science, Medicine and Rehabilitation. He undertook his postgraduate research in physiology at the Babraham Institute, Cambridge, obtaining his PhD from the University of Cambridge. After working as a postdoctoral researcher at Kings College London, he moved into a career in scientific publishing and worked at Portland Press/Biochemical Society before joining the BMC Series in June 2015.